Yes, I like alliteration. Anyway, I have had in front of me for awhile two newspaper ad clippings for Vermont events today – PERU FAIR and the 20th ANNUAL AUTUMN ROUND-UP in Ludlow (I had seen this advertised at the Dublin Engine Show). BLUE BELLE and I were on the road before 9 for Peru (Vermont that is). Parking was at Bromley Ski Resort (45 miles from home) with a free shuttle bus back to Peru. 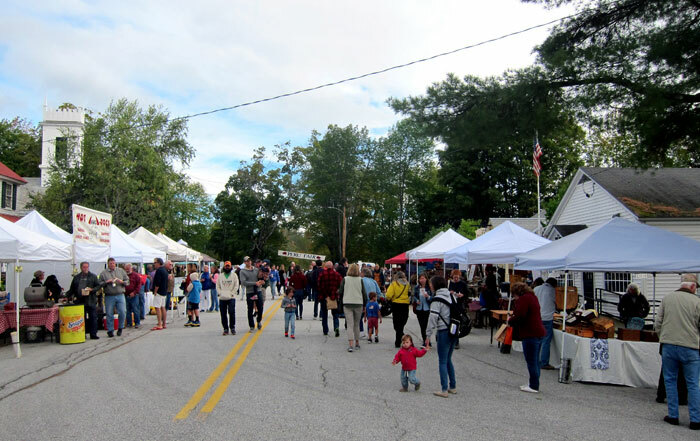 Peru is just off Route 11, and I highly recommend you swing in to see this bucolic small village and village green. 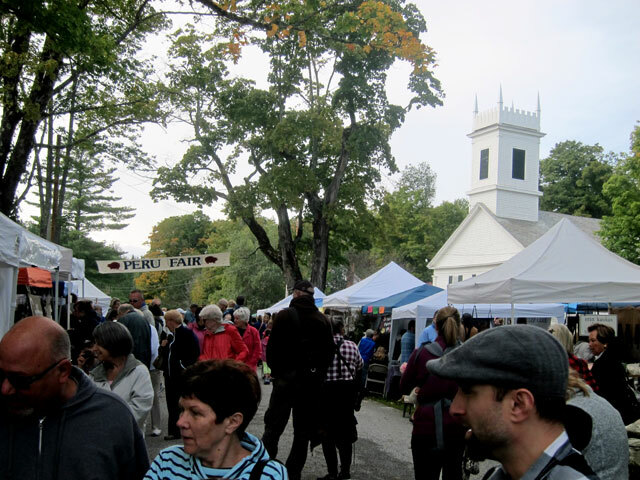 there were over 100 vendors – basically crafts (not my thing) along the small Main Street and around the common. Here is a view from the south end of Main Street looking north. Interesting stilts on this lady – or an interesting tall lady. 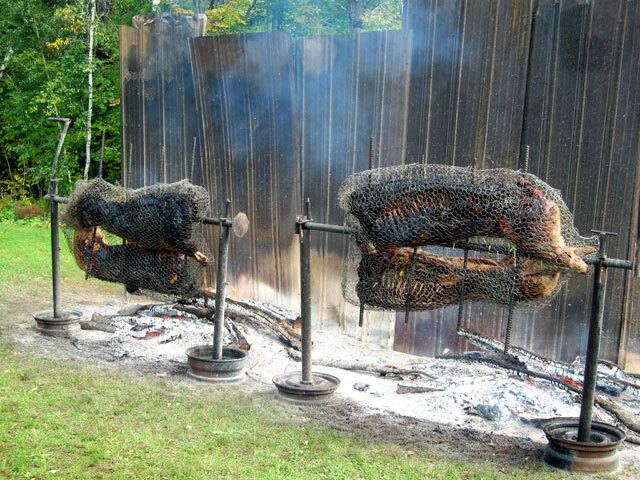 The roasting for the Pig Roast was underway, but I was hours early to partake. 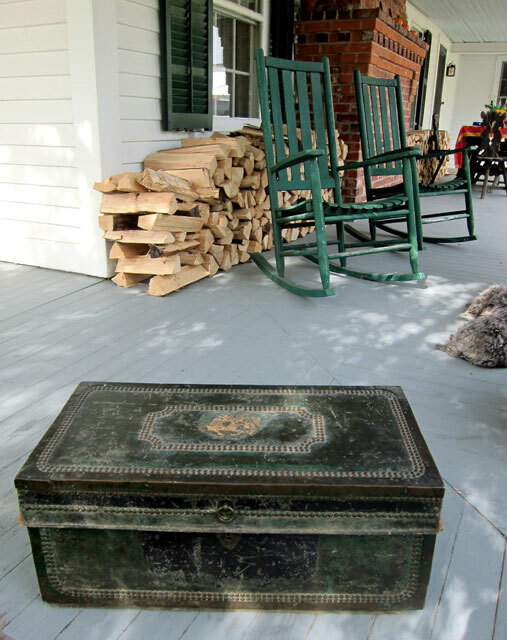 It was fun, it was country Vermont, and at one home on Main Street there was a “Gourmet Yard Sale.” You know I love candles and candle holders, but I am also attracted to boxes. Some interesting things, but I zeroed in on this canvas covered, brass tacks, copper or brass fittings, maybe a stage coach chest for gold bullion? Could not believe the price – they forced me to buy it – $10 – just look at the patina. I left it on the porch until I was ready to catch the bus back to Bromley. Hey, another rocking chair study as a bonus. the first spot at home this small chest gravitated to, and it may stay there. Packing my new box (maybe a chest for the foot of a bed?) into BB2, we headed east on Route 11 and turned left on a backroad to Landgrove. RAY RECOMMENDS, no RAY INSISTS that you visit the tiny bucolic and perfect Landgrove, Vermont, and head out past the Landgrove Inn. It is a dirt — and, the best dirt road around, better than many (or most) of the tarred or macadam backroads I encounter. Passing the Inn, Weston Road becomes Landgrove Road (unmarked probably) and eventually after passing fantastic views and architecture you come down the hill onto the Common in Weston. Once in Weston I took VT 100 north into Ludlow, right on Route 103 to find the left turn on Commonwealth Avenue. Up, up the hills, finally dirt, and Commonwealth became Barker Road. As I approached Barker Farm “in the scenic hills of Ludlow, Vermont” as the ad read, I was enveloped in one of the largest sprawling construction projects I have seen. More at the end. 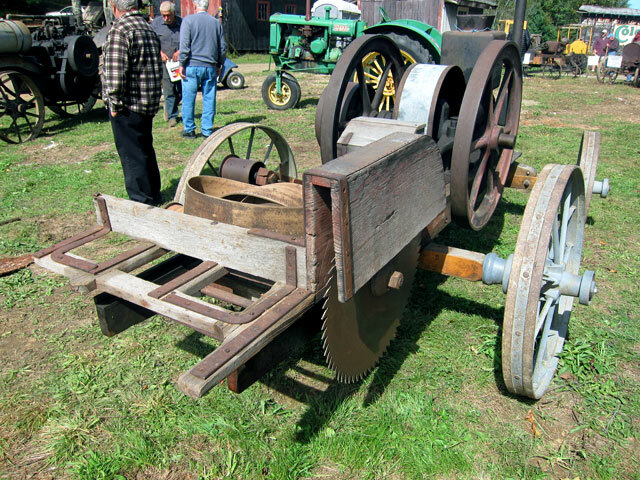 At the Dublin show, I saw a notice for this event, and also clipped a newspaper ad for the 20th Annual Autumn Round-Up: Antique Tractor & Machinery Show. You will not find a website or much information. 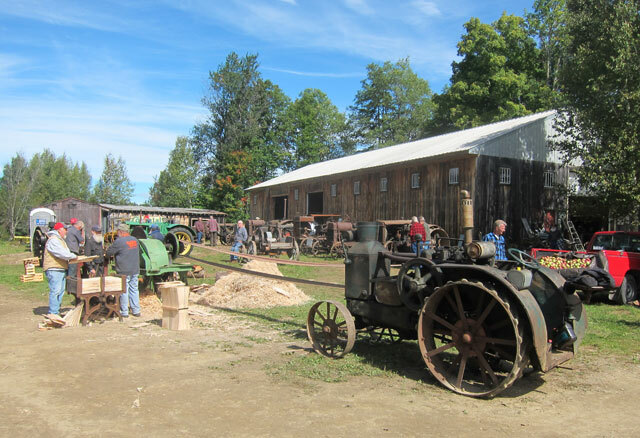 This is a small gas engine and farm show, and is hosted on the farm of Dan Moore, featuring his collections around the property. Here is a look as I entered this event. I will again attend. I walked down the hill from the fields where I parked BLUE BELLE (for free as an “exhibitor” – “do you mind if people look at your car,” the lady asked at the entrance. “No,” my easy reply. And, the $5 saved paid for my hamburger for lunch). 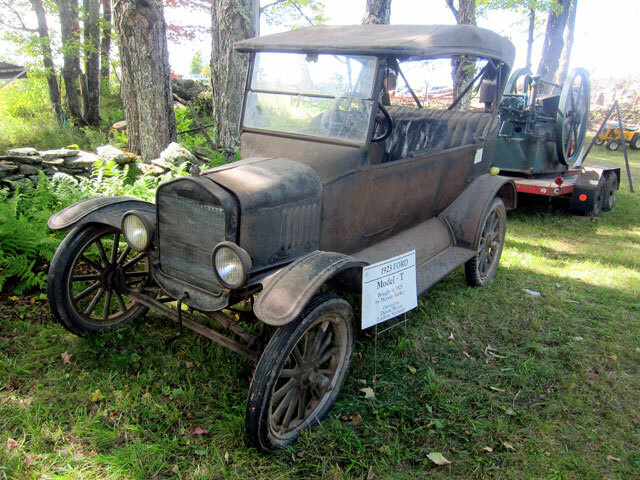 Under the trees was this 1923 Model T Touring – ORIGINAL – I love original. 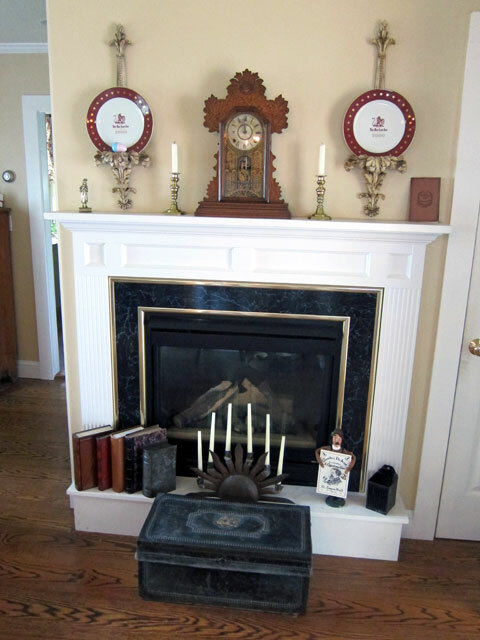 It was bought used by the Barker family in 1925, and been on the farm since. I am betting Dan Moore married a Barker. 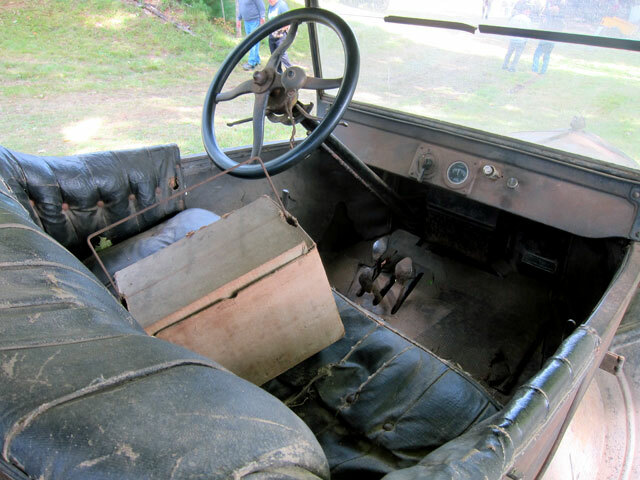 My Dad had me first behind the wheel of his 1919 Model T Touring on US Route 7 in Wilton – prior to legal driving age. On the front seat of Dan’s T is a box of Ford Briquets (writing on the opposite side) for a roadside picnic. My Dad had a similar box or two. On the back floor was an original hand tire pump with the Ford Script, and some license plates. A 1937 Vermont plate still hung on the rear. If you would like lessons on how to drive a Model T, buy me one and bring it over. This rig was at Dublin earlier in the month. I found out it is Dan Moore’s. here is another gallery that you can open for larger size images of equipment I had not seen before. I really enjoy trying to figure out how all the mechanisms work. Hit and Miss, driving a pump to compress air. This Cordwood Saw was made almost in my backyard across the river. It is an 1909 Abenaque Gas Engine. Here is the first of two short videos at this meet for you – first haying and a panorama. 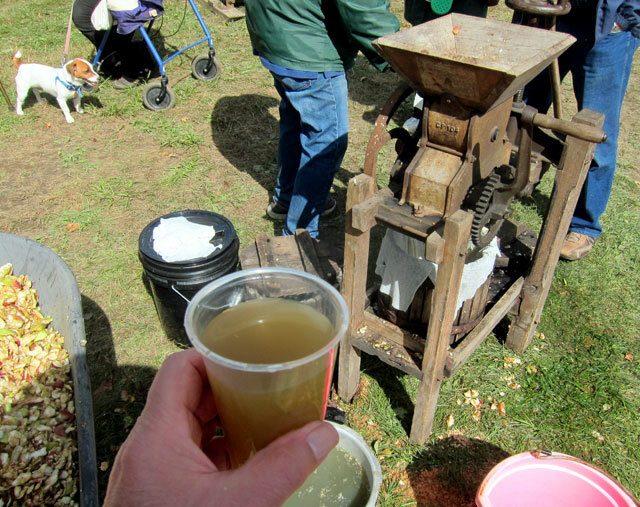 Pressing cider by hand. 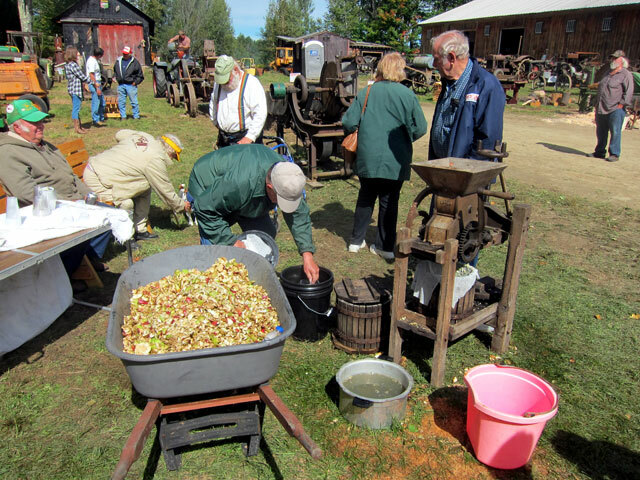 The yellow jackets were enjoying the shavings in the wheelbarrow, and I was served a glass of apple juice pressed probably within the hour – yes, good. and, another unique use of a hit ‘n miss engine that I had to share – probably could be used with a baby cradle also. 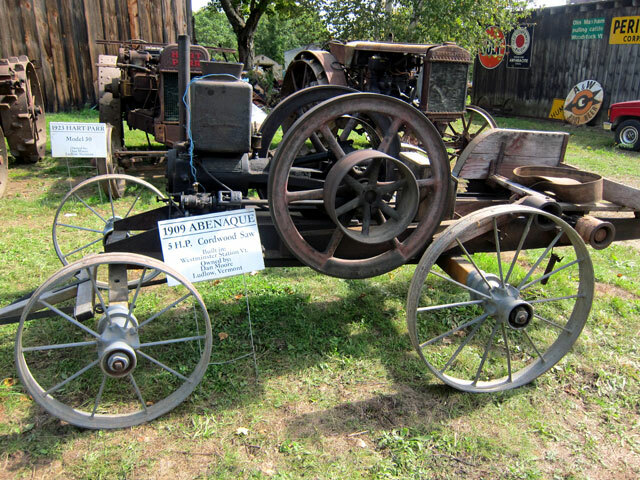 As I mentioned before, this gas engine, tractor and farm event is small, probably a small club, and hosted by Dan Moore to be able to share his massive collection. Isn’t that one of the reasons we collect things, to share? Here is a gallery to open up of some more of his collections around this main area. I felt like I was right in the middle of an AMERICAN PICKERS filming set for The History Channel. If you lost your keys to lock your Cadillac doors, let some trees grow to do the job. I mentioned earlier that as I approached the farm I was surrounded by a massive project. Hopefully you can see part of it in this panorama from the parking field on the other side of the road (you can click for full screen). Obviously a solar field. While eating my hamburger on a bench I listened to several visitor’s conversations about it – questioning the sensibility. And earlier I chatted with a couple who said that with taxes so high in Ludlow, and farming no longer profitable that Dan had to do something to “save the farm.” Playing with google he also has SCCA (Sports Car Club of America) races on the property. That couple said the lease was for 20 years, and if not renewed, all of the facilities must be removed, and the land restored. Leaving the event I found Barker Road terminates at a massive power transmission sub-station and high-wire towers and lines. In reading articles on line, I found that this is the Coolidge Solar Project for a 20-megawatt array that will include approximately 83,000 solar panels.The project is using 88.5 acres of a the 155-acre farm. In the next 20 years $15 million in labor income and more than $25 million in gross domestic profit will be generated for Vermont. Also, the array is supposed to increase state and local tax income by nearly $4 million. “During construction, which is projected to last six months, the project will employ about 80 people, according to state documents. “Four full-time permanent positions are expected thereafter.” One article reported the project is, “four times larger than any other Vermont solar installation.” The power generated is heading to Connecticut if I read correctly. So, google the Coolidge Solar Project, and see what you can learn about “my find.” Learning keeps us young, I believe. Also travel over the hills between Ludlow and Proctorsville – see this facility, and just keep exploring. 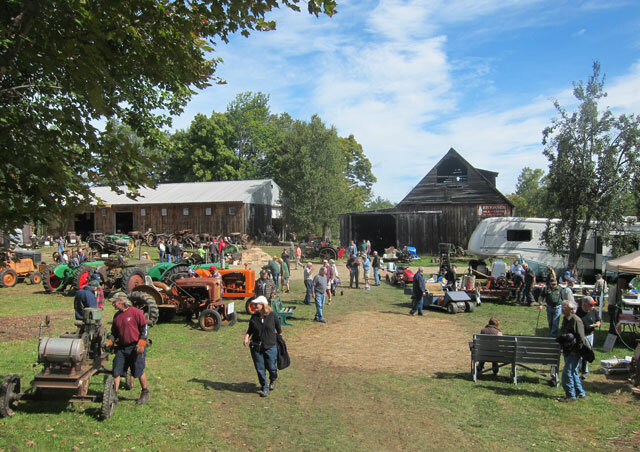 This entry was posted in Day (or maybe two) Trips and tagged Annual Autumn Round-Up, Coolidge Solar Project, Hit 'n Miss engines" Dan Moore, Ludlow Vermont, Peru Fair, Peru Vermont, Vermont. Bookmark the permalink. A real trip back in time on this trip. Great. Thanks for letting us visit also.